‘Obsolete records’ releases albums in very few copies, usually around thirty, if I’m not mistaken. On one hand I find this somewhat frustrating to not be able to get them all in time, but on the other hand, and unlike many mini labels who releases small number of copies for each release (I owned such a mini label once), it brings ‘Obsolete’ records a kind of novelty feeling to each album I have heard so far, and the reason is that these albums sound both strange and interesting enough for me to anxiously wait for the next album to be released under these obsolete wings, and in an obsolete looking packaging, which always works wonderfully with the theme of the album. 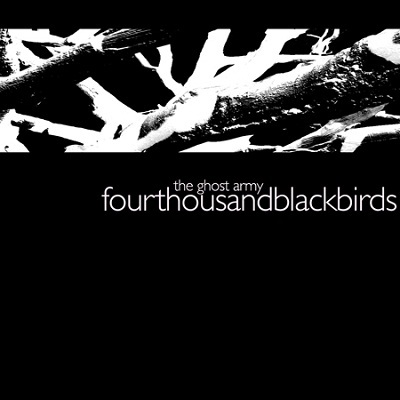 So we have fourthousandblackbirds, which is a great name, to start with, and each of these three tracks is a collaboration with more artists. The results are somewhere between liquid experimental and minimalist music, and deep drones that bury vague human voices as samples inside them. Fourthousandblackbirds flies with a supernatural aura of dark mystery through the moist urban desert, bringing intense tones of heavy meditation, almost to the point of black ambient, at least on the fantastic ‘Untitled #2’. ‘The Ghost Army’ is a wonderful album, and as mentioned above, limited to 33 copies. Look for it.